Those of you involved in research may empathise when I say that I spent all of today (or at least a good 8 hours of it) working on a grant application. The good news is that it is now largely done, or at least done as a complete draft. The other good news is that my life has had plenty of distractions from out-of-hours work. It was my birthday last week, and birthdays do make for nice distractions. Mr Bite excelled at making this one particularly nice. I got sparkly flowers, above, a voucher to unleash myself at Whole Foods or Planet Organic (dangerous! ), a dinner promise for 222 Veggie Vegan (exciting! ), a new memory card (essential, with the number of photos I take), an amazingly enormous guide to touring Britain, and ticket to the ballet, The Nutcracker. We went to the ballet on Friday evening and it is a sign of my age that this was the latest that we've been out in central London since our move. And we were still home by 11pm (!). 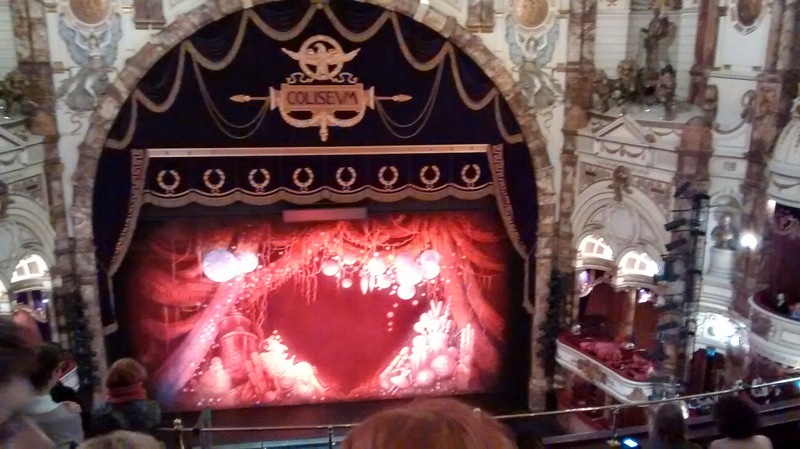 It was absolutely worth the late-for-me night out, with the English National Ballet performing beautifully and the setting in the Coliseum really rather stunning. All in all, I was spoilt. The raspberry and yoghurt cake I made for my birthday was a final addition to events. In truth, the first night we had this I wasn't very convinced by it. I had been aiming for a cake. but it was really more like a bread. Moreover, the flavours didn't seem quite right. I adapted it quite extensively from a non-vegan recipe so completely blamed myself for this. However, after a day in the fridge with the raspberry topping left to soak in, this became very enjoyable. It was still more of a bread than a cake, but a moist, raspberry-filled, delicious bread. I am thus sharing the recipe, but with a note: leave it for a day after making! Preheat your oven to 180'C (350'F) and prepare a rectangular loaf tin. Combine the coconut oil, chia seeds, maple syrup, yoghurt, milk and vanilla in a bowl. Add the flour and baking powder and beat well to combine, with electric beaters or by hand. The mixture will be quite thick. Stir in approximately 1 cup of raspberries and transfer the batter to your prepared tin. Bake for approximately 40 minutes, or until a skewer inserted into the loaf comes out clean. Heat the remaining cup of raspberries and caster sugar in a saucepan over low heat until the sugar is dissolved. Allow to cool. Spread over the top and sides of the loaf when it has cooked and cooled. Have you had baked goods that start off tasting average but improve on sitting? It doesn't happen with many recipes I make, so this one was a relief and surprise. Sounds like a fun birthday! I like to add almond extract to cranberry bread and maybe some almonds, too. Happy birthday! Ooh, I would love that. Sadly, my husband not so much! happy birthday kari - sounds like a great day - and lots of birthday fun - ballet and dinner is a nice treat and the touring guide is a nice promise of many trips to come. Your cake looks delicious - I often find that dinners or cakes that don't seem quite right can change favourably overnight - it is true culinary magic! Happy birthday! Oh I remember the pain of community grant applications when I was working. This loaf looks great! I love using coconut yoghurt in baking. And I'm on a real raspberry kick at the moment! Coconut yoghurt would have been great in this I think! Happy belated birthday! It sounds like you had a marvellous day. Your raspberry and yoghurt cake is just the ticket - I love that sort of cake. I love using yoghurt in my baking, as I find it makes everything really light and fluffy. AHHH!! I LOVE ballets! I'm going to the nutcracker this weekend! (So excited!!) this is such a fun time of year to hit up a show! ...also, that loaf looks amazing! Such a lovely treat! YUM! Happy belated birthday, my sweet friend! Looks like you had a wonderful time with Mr. Bite! hopefully one of these days, Tim will take me to a ballet. This would made for a wonderful breakfast or an accompaniment to tea! Thanks so much Min :-) It actually took until this year for Mr B to venture to a ballet, so there is hope for you I think! That is outrageous - all of the events this week have been terrible. I hope things can get back to normal soon. Belatedly, Happy Birthday! It sounds like you were very lucky with your gifts. Been there done that re. the grant application, I feel your pain! Good luck. Happy birthday! I love the optimistic 'best after sitting for a day or two' - I definitely couldn't manage that level of restraint with that cake in front of me! Well, I did eat it earlier too ;) Just enjoyed it more after waiting! A very belated happy birthday Kari! I've been a little absent from the blogosphere lately so am just catching up. The ballet sounds like the perfect way to celebrate and you definitely did well on presents! This means that you actually burn fat by consuming Coconut Fat (in addition to coconut milk, coconut cream and coconut oil).